The board is made in full ATX format, has Military Class 4 components and possesses OC certificate. Four memory slots support up to 32 GB (non-ECC and XMP modules) DDR3 Dual Channel RAM with a maximum clock speed up to 3000 MHz. The rest of the equipment is related to seven PCI Express slots (three and four 3.0 x16 2.0x1), mini PCI Express slot, eight SATA 6 Gbps ports, Gigabit LAN (Killer E2205), Wi-Fi, Bluetooth, DisplayPort (4096x2160@24) two HDMI (4096x2160@24) and 8 channel audio. Two antennas for wireless connectivity are also included. 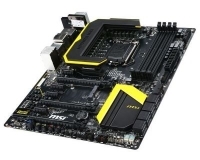 To connect additional equipment, MSI has provided six USB 3.0 and two USB 2.0 ports on the back of the motherboard, while the additional four USB 3.0 and four USB 2.0 ports are reserved for connection via cable. So far, MSI has not announced when the board will arrive on the market and at what price.